GunCruzer Universal 3 Gun Case with wheels. Custom 3 gun competition case shown with cutouts for (1) HK P30 Handgun, (1) HK MR556 Rifle with scope and bipod, (1) Benelli M2 Shotgun, (1) extra barrel, magazines, and accessories. 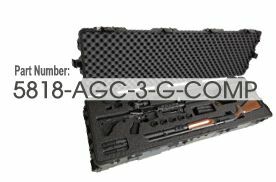 The AR Gun Case provides protection and transportation for 4 rifles. Prepper Handgun Case holds two pistols, magazines, and more. Shooting range handgun case is univeral and holds 4 pistols plus magazines. 2N2 GunPOD case is universal and allows for storage of two rifles/shotguns and two handguns. Apple, iPad, iMac, MacBook Air and MacBook are registered trademarks of Apple Computer, Inc.
CaseCruzer, Photo StudioCruzer, WineCruzer and EZ-PACK 'N' SHIP are trademarks of CaseCruzer, LLC.